Researchers have created a novel robot that could help patients who have suffered a stroke or spinal injury walk again while reducing the workload of physiotherapists. Survivors of stroke or other neurological conditions such as spinal cord injuries, traumatic brain injuries and Parkinson's disease often struggle with mobility. To regain their motor functions, these patients are required to undergo physical therapy sessions. 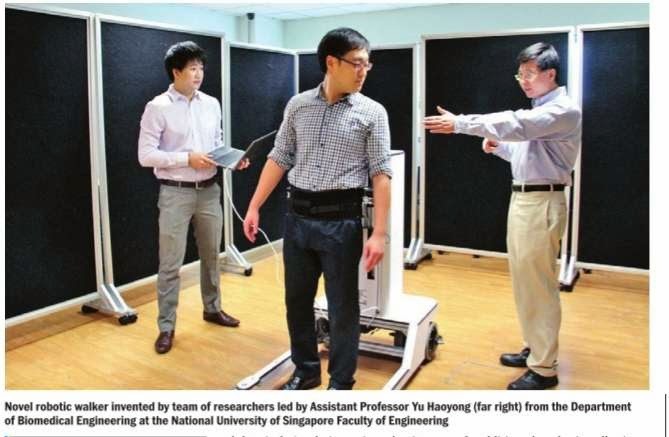 A team of researchers from the National University of Singapore's (NUS) Faculty of Engineering has invented a novel robotic walker that helps patients carry out therapy sessions to regain their leg movements and natural gait. The system also increases productivity of physiotherapists and improves the quality of rehabilitation sessions. Designed by a team of researchers led by Yu Haoyong, the robotic walker is capable of supporting a patient's weight while providing the right amount of force at the pelvis of the patient to help the patient walk with a natural gait. In addition, quantitative data can be collected during the therapy sessions so that doctors and physiotherapists can monitor the progress of the patient's rehabilitation. The robotic walker comprises six modules: an omni-directional mobile platform; an active body weight support unit; a pelvic and trunk motion support unit; a suite of body sensors; a function al electrical stimulation unit; and an intuitive user control interface. The suite of body sensors measures the gait of the patient so that the walker can provide the right amount of support to help the patient walk with a natural gait. The electrical stimulation unit can deliver targeted electrical current to stimulate the correct muscle at the correct timing to facilitate joint movement. The walker can also provide assistive force, resistive force, and disturbance force depending on the training requirements set by the therapists. In this way, patients can go through different training schemes that are often difficult to achieve manually. The patient interacts with the walker through a force sensor which detects the user intent. The intelligent control system uses this information as well as the gait information provided by the body sensors to control the movement of the walker. Another unique feature of this walker is that it allows the patient to practice gait movements by walking over ground instead of on a treadmill. Such features enable the gait training to be conducted in a natural and intuitive way for the patients. “This robotic walker allows patients to practice their gait movements continuously to optimize their therapy. When patients repeat the movements in a natural setting, the routine can be imprinted into their brains which gradually learn to correct from the damage resulting from their medical conditions,” explained Yu. In addition, the robotic walker is capable of collecting data on the gait kinematics and muscle activation pattern of the patient. Such information is useful for doctors and therapists to monitor the progress of the patients' recovery. Besides improving the quality of rehabilitation, the walker will also relieve physiotherapists from the physical strain of assisting patients with the exercises. Currently, gait training requires one or two physiotherapists to support the patient's body weight and trunk, and an additional physiotherapist may be needed to move the paretic leg. Such therapy sessions are labour intensive, and they are also ergonomically unfat vourable for the physiotherapists as they often suffer from back injuries. With this walker, manual therapy can be taken over by the robotic system, while physiotherapists can focus on providing better assessment and training guidance for patients. The device all so reduces the number of physiotherapists needed to conduct each session of rehabilitation, thereby increasing productivity and reducing the cost of care.. “Our vision is for the robotic walker to be installed at outpatient clinics and rehabilitation centres to benefit patients who need therapy sessions. There is also a possibility that patients can perform exercises in the comfort of their own homes,” said Yu.